San Diego, California. August 7, 2014 – NASA, Lockheed Martin and the U.S. Navy teamed up in a simulated ocean recovery of an Orion spacecraft test article this week. The team of technicians, engineers, sailors and divers prepared for various scenarios that could happen when NASA’s new Orion spacecraft lands in the Pacific Ocean following its first space flight test in December. The information gathered during testing will help ensure a safe and efficient recovery of the crew module and collection of flight test data after splashdown. Orion will complete its first test flight, Exploration Flight Test-1 (EFT-1), on December 4, 2014. During EFT-1, the uncrewed spacecraft will launch on a Delta IV Heavy rocket and will travel 3,600 miles beyond low Earth orbit. That same day, Orion will return to Earth at a speed of approximately 20,000 mph for a splashdown in the Pacific Ocean. The Underway Recovery Test allowed the team to evaluate procedures, hardware and personnel responsible for recovery of the capsule. Building on the knowledge gained from previous Orion recovery tests performed in calm waters near NASA’s Langley Research Center in Virginia, the agency’s Ground Systems Development and Operations (GSDO) Program began the next phase, seeking turbulent water off the west coast in which to practice recovering the Orion crew module, one parachute and a forward bay cover, which keeps Orion’s parachutes safe until being jettisoned, just before the parachutes are needed. During the recovery test, controllers at Johnson Space Center in Houston simulated the launch and splash down of the Orion capsule. An F-18 jet flew from 13,000 feet into a dive to simulate Orion’s descent through the atmosphere and splashdown, as Johnson confirmed tracking and cleared the air space. Helicopters were stationed in the air to observe the Orion capsule during descent, as they would be during an actual retrieval mission. The ship circled around to the floating test vehicle, and an integrated team of U.S. Navy amphibious specialists, engineers and technicians from Kennedy, Johnson and Lockheed Martin Space Operations practiced retrieving Orion, the forward bay cover and parachute. A sea anchor and recovery winch was attached to Orion. The recovery winch attachments were secured between Orion’s two main windows, near the heat shield. 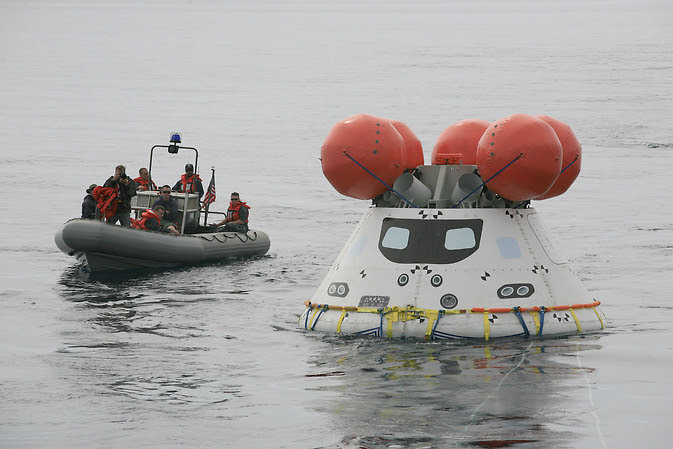 For the underway recovery test, even though there are no propellants or coolant on the capsule, the small boat teams examined Orion for leaks, just as they will following Exploration Flight Test-1. Then, two rigid-hull inflatable boats and two smaller Zodiac boats were used to help guide Orion into the Navy ship’s flooded well deck and secure it in a specially designed cradle. Water was drained from the well deck, leaving Orion secure and dry. Two more rigid-hull inflatable boats were used to secure and reposition the recovered forward bay cover and parachute to the port side of the Navy ship where a crane lifted them on the ship’s main deck. Generale said the underway recovery test allows GSDO to verify recovery operations and procedures, demonstrates capabilities and incorporates partnership efforts with the U.S. Navy and Lockheed Martin. Orion is the exploration spacecraft designed to carry astronauts to destinations not yet explored by humans, including an asteroid and Mars. It will have emergency abort capability, sustain the crew during space travel and provide safe re-entry from deep space return velocities. EFT-1 will provide engineers with data about systems critical to crew safety such as heat shield performance, separation events, avionics and software performance, attitude control and guidance, parachute deployment, and recovery operations to validate designs of the spacecraft before it begins carrying humans to new destinations in deep space.